This article describes how to reduce DPM storage consumption by enabling deduplication on DPM storage. In this scenario, DPM runs in a Hyper-V virtual machine and stores backup data to VHDs in shared folders on a Windows File Server with data deduplication enabled. In today’s environment IT admins are faced with the huge challenge of data growth as illustrated by the IDC projection for the world's data through the year 2020 below. 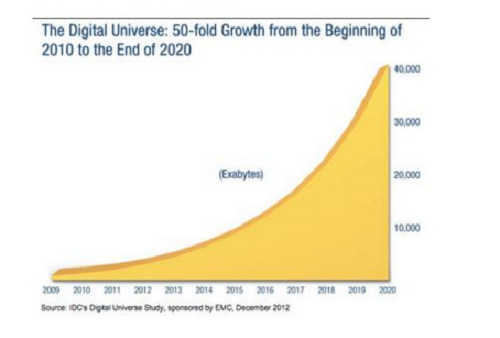 Increase in enterprise data growth leads to increase in backup storage needs. Data growth increases maintenance and hardware costs. 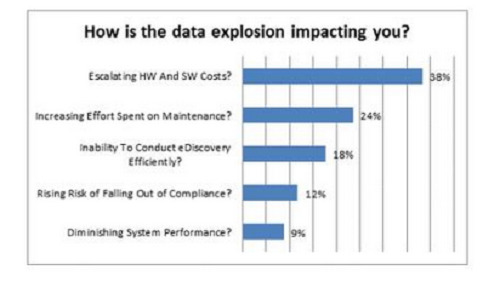 As shown below 62% of IT admins have concerns about increasing HW/SW costs and their maintenance cost. For the full survey see Is the Data Explosion Impacting You on the Informatica blog. IT admins backup production data to meet operational recovery needs and organizational compliance requirements. By its very nature backup is a highly storage intensive operation, and reducing backup storage consumption is one of the top priorities for IT admins. Deduplication can address the need to reduce storage consumption. While the amount of redundancy in any given set of data is dependent on the workload and data types used, it is typical for backup data to show strong savings when deduplication is used. Additional redundancy, and thus additional savings from deduplication, can result when backup data from similar workloads using similar datasets are processed together. DPM leverages deduplication to provide these benefits. Application-aware backup and recovery— DPM protects clients, servers, virtual machines, file server data, and application workloads. It provides flexible backup options, including the ability to back up some workloads as frequently as every 15 minutes. DPM has a broad range of recovery capabilities. For example customers can replace a current production SQL Server database with an older copy, recover databases to another location for investigation, or recover as files for providing a copy to the legal department. DPM helps IT admins pick and choose the kind of recovery they need.DPM supports end-user recovery. For example, a SQL admin, file system admin, or a client user can recover all of their data directly without requiring admin assistance. In a dynamic environment production servers are continuously creating new data. DPM provides peace of mind to backup administrators by providing instance-level protection which automatically finds and configures new data created by workloads. This eliminates the need for backup administrators to manually find new data instances and add them to the backup configuration. Enterprise scaling and centralized management: A single DPM server can protect 80 TB of production data or 100 production servers. You can deploy DPM Central Console to manage up to 100 DPM servers from a centralized location. Use DPM central reporting for simple generation of custom reports for all DPM servers. Efficient private cloud protection—Whether your private cloud datacenter is configured to run Hyper-V virtual machines on standalone servers or on Windows servers with remote connections to SMB file shares on Windows File Servers, DPM can back up virtual machines efficiently using DPM’s unique virtual machine backup technology. For example, DPM detects virtual machine migration and continues to protect the virtual machine automatically - without any active involvement from backup administrator. If the virtual machine migrates from host to host, same DPM server will continue to back up without any DPM modifications or manual steps. Cloud integrated backup—DPM is flexible enough to protect workloads deployed in a Hyper-V private cloud, in the Azure Public Cloud, or in a hoster cloud. Companies running Microsoft workloads on Azure can leverage DPM running on Azure to protect these workloads. DPM supports offsite backup to Azure using the Azure Backup Service. Azure Backup Service is integrated into the DPM protection and recovery workflows, making it easy to manage offsite backup settings, and retain data for multiple years. Azure Backup provides an alternative to tape backup, with the offsite shipping and tape maintenance it requires. Backup admins are now completely free from tape maintenance hassles. Data deduplication (dedup) was introduced in Windows Server 2012 as a next-generation replacement for the Single-Instance Storage (SIS) feature in Windows Storage Server 2008. It uses an advanced, variable block-size chunking algorithm to provide maximum deduplication savings per volume. A post-processing approach is used to preserve all file system semantics and to ensure negligible impact on the primary data path performance. For more information, see Data Deduplication Overview. Virtualized backup: Backup solutions (such as DPM running in a Hyper-V virtual machine) that save backup data to VHD/VHDX files on a Windows File Server. Read more about deduplication planning. Using deduplication with DPM can result in large savings. The amount of space saved by deduplication when optimizing DPM backup data varies depending on the type of data being backed up. For example, a backup of an encrypted database server may result in minimal savings since any duplicate data is hidden by the encryption process. However backup of a large Virtual Desktop Infrastructure (VDI) deployment can result in very large savings in the range of 70-90+% range, since there is typically a large amount of data duplication between the virtual desktop environments. In the configuration described in this topic we ran a variety of test workloads and saw savings ranging between 50% and 90%. DPM running in a virtual machine in a Hyper-V host cluster. DPM storage using VHD/VHDX files stored on an SMB 3.0 share on a file server. For this example deployment we configured the file server as a scaled-out file server (SOFS) deployed using storage volumes configured from Storage Spaces pools built using directly connected SAS drives. Note that this deployment ensures performance at scale. The scenario is supported for all workloads for which data can be backed up by DPM 2012 R2. All the Windows File Server nodes on which DPM virtual hard disks reside and on which deduplication will be enabled must be running Windows Server 2012 R2 with Update Rollup November 2014. We’ll provide general recommendations and instructions for the scenario deployment. Whenever hardware-specific examples are given, the hardware deployed in the Microsoft Cloud Platform System (CPS) is used for reference. This scenario uses remote SMB 3.0 shares to store the backup data, so primary hardware requirements center around the File Server nodes rather than the Hyper-V nodes.The following hardware configuration is used in CPS for backup and production storage. Note that the overall hardware is used for both backup and production storage, but the number of drives listed in the drive enclosures are only those used for backup. Use Parity Storage Spaces with enclosure-awareness for resiliency and increased disk utilization. Format NTFS with 64 KB allocation units and large file record segments to work better with dedup use of sparse files. In the CPS deployment, these are then configured as CSVs. Set UsageType to HyperV: This results in dedup processing open files, which is required because the VHDX files used for backup storage by DPM remain open with DPM running in its virtual machine. Disable PartialFileOptimization: This causes dedup to optimize all sections of an open file rather scan for changed sections with a minimum age. Set MinFileAgeDays parameter to 0: With PartialFileOptimization disabled, MinFileAgeDays changes its behavior so that dedup only considers files that haven’t changed in that many days. Since we want dedup to begin processing the backup data in all DPM VHDX files without any delay, we need to set MinFileAgeDays to 0. For more information on setting up deduplication see Install and Configure Data Duplication. To avoid fragmentation issues and maintain efficiency, DPM storage is allocated using VHDX files residing on the deduplicated volumes. 10 dynamic VHDX files of 1TB each are created on each volume and attached to DPM. Note that 3TB of overprovisioning of storage is done to take advantage of the storage savings produced by dedup. As dedup produces additional storage savings, new VHDX files can be created on these volumes to consume saved space. We tested the DPM sever with up to 30 VHDX files attached to it. Note that this step configures a storage pool as the disk or disks on which DPM stores replicas and recovery points for protected data. This pool is part of the DPM configuration and is separate from the Storage Spaces pool used to create the data volumes described in the previous section. For more information on DPM storage pools see Configure disk storage and storage pools. Dedup requires a special set of configuration options to support virtualized DPM storage due to the scale of data and size of individual files. These options are global to the cluster or the cluster node. Dedup must be enabled and the cluster settings must be individually configured on each node of the cluster. Tune dedup processing for backup data files—Run the following PowerShell command to set to start optimization without delay and not to optimize partial file writes. Note that by default Garbage Collection (GC) jobs are scheduled every week, and every fourth week the GC job runs in “deep GC” mode for a more exhaustive and time intensive search for data to remove. For the DPM workload, this “deep GC” mode does not result in any appreciative gains and reduces the amount of time in which dedup can optimize data. We therefore disable this deep mode. HashIndexFullKeyReservationPercent: This value controls how much of the optimization job memory is used for existing chunk hashes, versus new chunk hashes. At high scale, 70% results in better optimization throughput than the 50% default. EnablePriorityOptimization: With files approaching 1TB, fragmentation of a single file can accumulate enough fragments to approach the per file limit. Optimization processing consolidates these fragments and prevents this limit from being reached. By setting this registry key, dedup will add an additional process to deal with highly fragmented deduped files with high priority. Split days into non-overlapping backup and dedup windows. Set up custom backup schedules. Set up custom dedup schedules. Schedule optimization in the daily dedup window. Set up weekend dedup schedules separately, using that time for garbage collection and scrubbing jobs. #On weekends GC and scrubbing start one hour earlier than optimization job. Whenever the backup window is modified it’s vital that the deduplication window is modified along with it so they don’t overlap. The deduplication and backup window don’t have to fill up the full 24 hours of the day, but it’s highly recommended that they do to allow for variations in processing time due to expected daily changed in workloads and data churn. Read/restore operations: Effects on read operations are typically negligible and don’t require any special considerations since the deduplication feature caches deduplicated chunks. The success of deduplication depends on the overall system hardware capabilities (including CPU processing speed, I/O bandwidth, storage capacity), correct system configuration, the average system load, and the daily amount of modified data. You can monitor DPM using the DPM Central Console. See Install Central Console. Get the schedule status using the Get-DedupSchedule cmdlet. Monitoring the event log can help understand deduplication events and status. To view deduplication events, in File Explorer, navigate to Applications and Services Logs > Microsoft > Windows > Deduplication. If the value LastOptimizationResult = 0x00000000 appears in the Get-DedupStatus |fl Windows PowerShell results, the entire dataset was processed by the previous optimization job. If not then the system was unable to complete the deduplication processing and you might want to check your configuration settings, for example volume size. For more detailed cmdlet examples, see Monitor and Report for Data Deduplication. Be conservative in volume size requirements and allow for some overprovisioning of storage. It is recommended to allow for a buffer of at least 10% when planning for backup storage usage to allow for expected variation in deduplication savings and data churn. Monitor the volumes used for backup storage to ensure that space utilization and deduplication savings rates are at expected levels. The DPM virtual machine will be put into a pause-critical state and no further backup jobs can be issued by that VM. All backup jobs that use the VHDX files on the full volume will fail. Stop the DPM Server that owns the VHDX files on the full backup share. Create an additional volume and backup share using the same configuration and settings as used for the existing shares, including settings for NTFS and deduplication. Migrate Storage for the DPM Server virtual machine, and migrate at least one VHDX file from the full backup share to the new backup share created in step 2. Run a Data Deduplication garbage collection (GC) job on the source backup share that was full. The GC job should succeed and reclaim the free space. Restart the DPM Server virtual machine. A DPM consistency check job will be triggered during the next backup window for all data sources which previously failed. All backup jobs should now succeed. The combination of deduplication and DPM provides substantial space savings. This allows higher retention rates, more frequent backups, and better TCO for the DPM deployment. The guidance and recommendations in this document should provide you with the tools and knowledge to configure deduplication for DPM storage and see the benefits for yourself in your own deployment. Q: DPM VHDX files need to be 1TB of size. Does this mean DPM cannot backup a VM or SharePoint or SQL DB or file volume of size > 1TB? A: No. DPM aggregates multiple volumes into one to store backups. So, the 1TB file size doesn’t have any implications for data source sizes that DPM can backup. 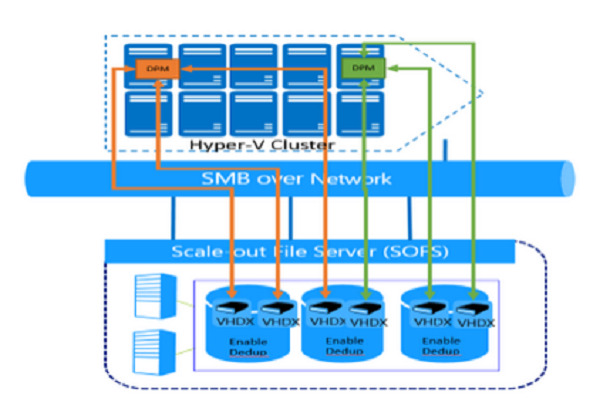 Q: It looks as though DPM storage VHDX files must be deployed on remote SMB file shares only. What will happen if I store the backup VHDX files on dedup-enabled volumes on the same system where the DPM virtual machine is running? A: As discussed above, DPM, Hyper-V and dedup are storage and compute intensive operations. Combining all three of them in a single system can lead to I/O and process intensive operations that could starve Hyper-V and its VMs. If you decide to experiment configuring DPM in a VM with the backup storage volumes on the same machine, you should monitor performance carefully to ensure that there is enough I/O bandwidth and compute capacity to maintain all three operations on the same machine. Q: You recommend dedicated, separate deduplication and backup windows. Why can’t I enable dedup while DPM is backing up? I need to backup my SQL DB every 15 minutes. A: Dedup and DPM are storage intensive operations and having both of them running at the same time can be inefficient and lead to I/O starvation. Therefore, to protect workloads more than once a day (for example SQL Server every 15 minutes) and to enable dedup at the same time, ensures there’s enough I/O bandwith and computer capacity to avoid resource starvation. Q: Based on the configuration described, DPM needs to be running in a virtual machine. Why can’t I enable dedup on replica volume and shadow copy volumes directly rather than on VHDX files? A: Dedup does deduplication per volume operating on individual files. Since dedup optimizes at the file level, it is not designed to support the VolSnap technology that DPM leverages to store its backup data. By running DPM in a VM, Hyper-V maps the DPM volume operations to the VHDX file level, allowing dedup to optimize backup data and provide larger storage savings. Q: The above sample configuration has created only 7.2TB volumes. Can I create bigger or smaller volumes? A: Dedup runs one thread per volume. As the volume size becomes bigger, dedup requires more time to complete its optimization. On the other hand with small volumes there is less data in which to find duplicate chunks, which can result in reduced savings. So, it is advisable to fine tune the volume size based on total churn and system hardware capabilities for optimal savings. More detailed information on determining volume sizes used with deduplication can be found in Sizing volumes for Deduplication in Windows Server. For more detailed information on determining volume sizes used with deduplication see Sizing Volumes for Data Deduplication.